Heyyas! Just wanted to give my perceptions (admittedly subject to bias) of the Boggle Battle between Ms. Portia Lee and myself, last Sunday, February 11. First, a little background... Readers may or may not be aware that Portia bought a house from me, after she and Morticon decided that they didn't want to stay on as Soul_Fox's guests, at Redwood Harbor, indefinitely, after SED HQ was destroyed by forces unknown. I showed Portia and Morticon a path leading off from the Lowlands Road in Keresztulerdo, and set up an offer to sell them a haunted house there, off among the foothills. The negotiations were interesting. Portia bemoaned not having enough cash to meet my asking price; when I affirmed that I had made my primary offer at rock bottom, she (grudgingly) forked over the previously unavailable balance, and made some grumbling noises about how I didn't know how to properly haggle. I think Portia was rather used to having her way, and, disappointed that I was unresponsive to her financial "distress." On a later date, Portia challenged me to a Boggle duel, charging me with having behaved in an "ungentlemanly" manner when I sold the house to her. Of course, the fact that Morticon was also going to field bets on the outcome to rebuild his fortunes was another possible reason for the challenge. Boggle is a straightforward game, much like a wordfind. A host "shakes" the pieces into play, and the result is very much like what you see in the Sunday Paper. But that's where the similarity ends. From there, the players each have 3 minutes to "find" as many words in a 4 by 4 grid of random letters as possible. Words can be upside down, backwards, forwards, and even overlap. Any words located by both players are eliminated, and words found by only one player earn a base 1 point for words 3 or 4 letters long, plus 1 point per additional letter for longer words. The tournament consisted of 5 3-minute rounds, for the highest point total. Observers Alicia, Slug, Austin, Roofus_roo, were present, in addition to Morticon, in a separate, sound-proof booth, and were able to view the board, just as Portia, Chanspot, and I could. After five rounds, the final score was 59 Portia, 68 yours truly. As I prepared to leave, I mentioned that I was going to see Morticon about the winners purse; Portia seemed surprised and upset about that. I explained that I had asked Morticon earlier what the winner had coming (aside from bragging rights, something on which I prefer not to capitalize), and, he had informed me that the winner would receive an (unspecified) portion of the total take from the betting. Portia was prepared to dispute the validity of the game, as she had not been so informed, but, Chanspot advised her that the betting was separate from the play of the game, and, upheld the results. As it turned out, though he did award me a 500 shiny purse, Morticon didn't make any money at all; it appeared that those who had come to watch had wagered on me *earblushes*. Alicia seemed particularly pleased, and graciously gave me 5,000 shinies, a portion of her winnings. Slug was happy about the shiny he won. The wagers of the other observers, if any, were not mentioned. Morticon smirks at Ray, "You defeated Evil with a board game. How about that?" Chanspot coughs into its paw, and grins. You purr, "I dunno about 'evil,' Mort.... Mebbe a tad peevish." If anyfur is interested in playing Boggle, or, any of the many games available at the Cash Creek Casino, they should go to luge N2 W2, sw, c. Chanspot and the rest of the staff will be glad to host you at their amusement hall in a friendly and cheerful manner, and, wagers are even required. Until next time, be well, all! Portia held an intimate gathering for Valentine's Day February 14th. Intimate in that it was a small, friendly, quiet gathering and not "intimate" in the adult sense. Although only one couple was there, some single folks came by. Perhaps other couples were celebrating the holiday in other places. Having romanic dinners, going on dates, or just enjoying their love of one another. The group discussed love, relationships and how best to develop both. And how best not to. Sources suggest that those single folks willing to delve within themselves to descibe their thoughts on love have a good chance of finding it. The theme and ambiance of the event even brought forth an admission from Morticon, local wallaby, that he loved Portia, local red panda. It is assumed that Portia returned the feelings of affection heard and discussed at this gathering of romatics. Haruka, a spokesperson for Kunoichi Corporation, has released the following statement on the company's behalf: "We are honored to be allowed to move our corporate headquarters here to Spindizzy. This should present new business opportunities, not only for The Corporation but also for the various organizations within the community. The Corporation provides specialized employees for a myriad of tasks, depending on the employer, as well as various other financial ventures. We look to serving the community of Spindizzy in the very near future." Kunoichi, local human from my world, Earth, is Japanese, as is her associate, Haruka. They both have drawn considerable interest on SpinDizzy. Seemingly an accomplished businesswoman, Kunoichi has already begun construction on a large corporate campus which is beautifully landscaped. Having met both Kunoichi and her associate Haruka, this reporter has found them to be polite, intelligent individuals. However, some rumors have been heard considering the kind of business the Kenouchi Corporation engages in. Having no evidence of this sort of activity, @Action News will wait until such activities make themselves evident, if they do, before reporting them. Darius, local ferret, noted that he has been suprised to see so many humans coming at once. Patch O'Black, local Jellicle cat, when asked for his impressions of the two replied, "I have found them both to be charming individuals. They have also shown an interest in the various crops I grow in my Jellicle Fields, as well as my ice cream parlor." MOrticon, local wallaby, has expressed keen interest in the intentions of the Kunoichi Corporation, perhaps due to concerns about its impact on his hopes to rebuild the now defunct, Society of Evil-Doers. 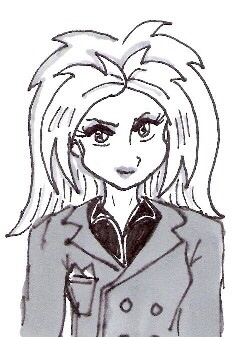 It is hoped that Kunoichi will find time to schedule an interview with @Action News in the near future. Greetings, Ba'ar here with YOUR Spindizzy @Action News survey for this week. In the spirit of the season (Valentine's Day) may I ask, if you weren't in love (or had no one special) on Valentines' Day, how would you commemorate the day? Clarisa would be answering silly survey questions, probably. Austin says, "What about the day would need commemoration if I weren't in love or had no one special on Valentine's Day?" Borris Gruffs, "Will sleep in late, and do normal things." Slug chirps, "Call me a Grinch, but I just ignore it. I'm not particularly fond of V-Day. I don't go around ranting and crying that it's a shallow Hallmark Holiday and that I'm alone, and all that. I just go about business as usual." Andros says, "I'd buy a big load of candy and completely pig out." Chanspot eyes the chocolates, "If I had no love...this supposes a reality where chocolates would not exist!" PatchO'Black mews, "I would try and celebrate with family and/or friends, Ba'ar." Why centaurs and raccoons get along so well. 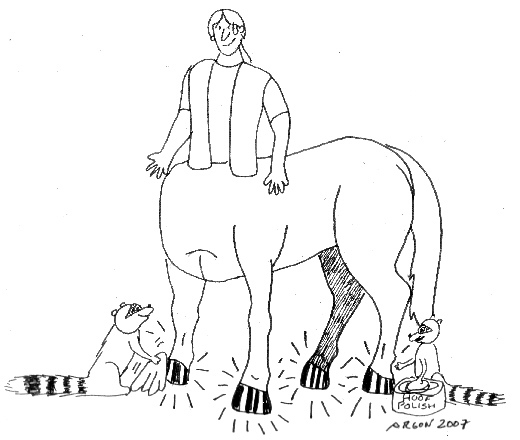 Centaurs like shiny hooves, and raccoons like shiny things!